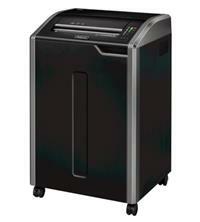 This heavy duty shredder from Fellowes is ideal for 10+ users in a busy office. Shredding up to 28 sheets of 75gsm paper at a time, the Fellowes Powershred 485Ci Cross-Cut Shredder will shred your documents into particles measuring 3.9mm x 30mm. This gives it a P-4 security rating, suitable for the shredding of highly confidential papers and documents. The huge bin capacity of 142 litres enables you to shred a large quantity of material before you need to change it and the bin is a pull-out style which is easy to empty. As well as paper, the shredder also enables you to shred credit cards, CDs/DVDs, staples and paperclips - allowing you to shred a wide variety of material and meaning you don't have to spend time prepping documents for staples and paperclips before shredding them. Another great feature of the Fellowes 485Ci is continuous shredding. This means that the shredder can be used continuously without having to let it cool down, ideal for busy offices with multiple users. Other handy features of the shredder include: a 100% Jam Proof system which eliminates paper jams and powers through tough jobs (this uses a sensing mechanism to read how much paper you are trying to put through in each pass and a straight feed indicator to show if the paper being inserted is crooked); SafeSense Technology which immediately stops the shredder if hands touch the paper entry; a reverse option; an Energy Savings System which powers down the shredder after periods of inactivity; an auto-oil mechanism which oils the cutters (simply keep the oil topped up as prompted); casters for easy portability in the workspace; a control panel with handy indicator lights; and a wide paper mouth entry of 405mm. Manufacturer warranty on the Fellowes Powershred 485Ci Cross-Cut Shredder is 2 years for the machine and 20 years for the cutters.